Above: A publicity photo of Grant Withers in the 1936 Paramount feature Border Flight. Although Grant Withers’ best-known film work was as a heavy in feature films, he also starred or co-starred in five serials during the 1930s. A husky, gruff-looking man, Withers was unequaled at making his heroes seem tough and determined; his grim, dogged manner seemed positively hard-bitten at times. However, Withers’ characters never seemed cranky or thuggish, thanks to the actor’s ability to inject wryly laconic humor into his roles. Withers could glower at the villains and/or beat them up most convincingly, but he was also quite convincing when bantering with his leading lady, expressing humorous irritation at the antics of his sidekick, or non-condescendingly discussing strategy with his kid assistant. Withers was never a “name” for producers to build a serial around, unlike Buster Crabbe, Buck Jones, and other cliffhanger leads of the 1930s, but his somewhat hard-boiled screen personality was as distinctive in its way as those of his more famous contemporaries. Born Granville Withers in Pueblo, Colorado, Withers worked as a salesman, a reporter, and a movie extra after finishing high school; the last-named job proved the springboard to his acting career, which began in 1926. His earliest work was as the lead in several dramatic shorts that were part of an ongoing film series called “Fighting Hearts.” Withers was quite “tall, dark, and handsome” at this point in his career, and he quickly became a popular Hollywood leading man, starring in dramas, action films, and romantic comedies, including many for Warner Brothers. However, Withers’ popularity with the major studios began to wane in the early 1930s, perhaps partly because of the bad publicity resulting from his 1930 marriage to 17-year-old Warner Bros. starlet Loretta Young and the marriage’s 1931 annulment. Whatever the reason, Withers soon began to star chiefly in independently-produced B-films, and dropped out of Hollywood altogether in 1932. After a lengthy absence not explained by any of my sources, a somewhat heavier and more grizzled Withers returned to movies in 1934. His first screen work that year was The Red Rider, one of Universal Pictures’ best Western serials, and the first of Withers’ six chapterplays. Withers wasn’t the principal hero in The Red Rider, but he had a better-than-average second-lead part as “Silent” Slade, the best friend of hero “Red” Davidson (Buck Jones). Withers’ character was framed for the murder of his sweetheart’s father, and was sentenced to hang, but Jones (the sheriff) allowed him to escape jail, forfeiting his badge as a result. Withers infiltrated the gang of the real killer, outlaw/smuggler Walter Miller, and aided Jones’ battles against the gang from the inside. Withers gave some real dimension to the stock part of the hero’s wrongfully-accused friend. He conveyed true frustration at being forced into a fugitive’s life, and seemed genuinely menacing when he briefly allowed his frustration to overcome him and threatened to kill Miller outright. He also interacted well with Jones and Miller: his friendly rapport with Jones helped to make their characters seem like actual old pals, while his sarcastic quips at the ill-tempered Miller’s expense, even while posing as one of his men, were highly enjoyable. 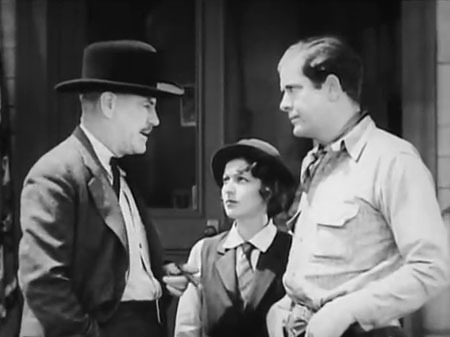 Above: Margaret LaMarr watches as J. P. McGowan engages Grant Withers in an argument that will later cause Withers to be accused of McGowan’s murder in The Red Rider (Universal, 1934). Universal immediately cast Withers in a second serial, a cliffhanger based on Hal Forrest’s comic strip Tailspin Tommy. Like Red Rider, Tailspin Tommy was an excellent serial, but Withers’ role was not as large as his part in the earlier serial had been. 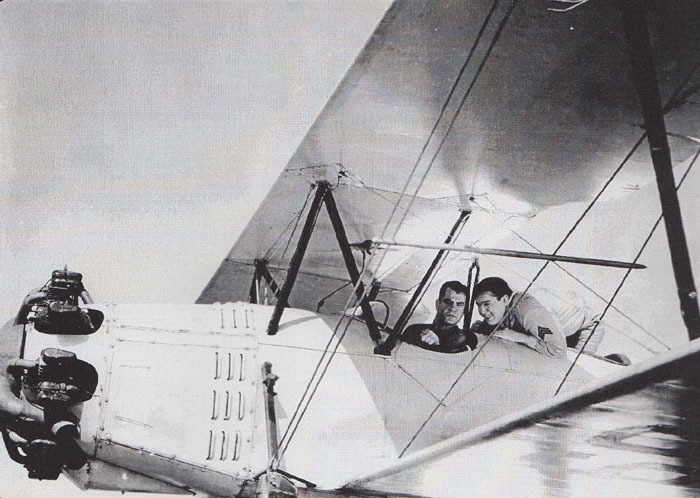 He played Milt Howe, a veteran pilot who was aided after a crash landing by young garage mechanic Tommy Tompkins (Maurice Murphy); Howe returned the favor by helping Tommy fulfill his dream of becoming an aviator. Tommy went to work for Howe’s employer, the Three Point Airline, and soon found himself trying to prevent the company from being taken over by unscrupulous competitor “Tiger” Taggart (John Davidson). Although Withers figured prominently in some of Tommy’s action scenes, the serial belonged to youthful stars Maurice Murphy, Noah Beery Jr., and Patricia Farr, and Withers’ role was definitely a supporting one. However, his friendly but taciturn performance as the tough veteran flyer was an interesting one; he managed to give the impression that Howe had seen lots of exciting action in his time, but felt it too unimportant to mention. 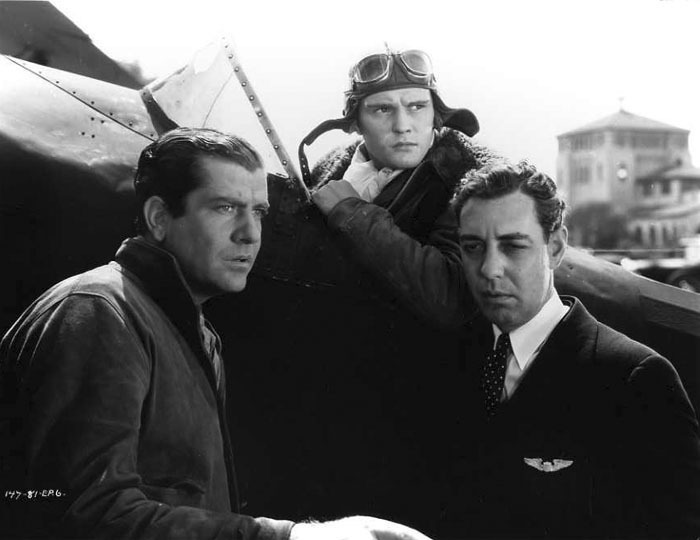 Above: Grant Withers, Maurice Murphy (in plane) and Paul E. Browne in Tailspin Tommy (Universal, 1934). The publicity material for Tailspin Tommy in the Great Air Mystery (Universal, 1935) displayed Withers’ name prominently, but unaccountably he wasn’t featured in the finished serial; the role of Howe in this sequel was filled by J. Pat O’Brien. Withers returned to acting in B-movies, playing supporting parts, villains, and occasional heroes, before landing a new serial role, that of Corporal Larry Lawrence in The Fighting Marines (Mascot Pictures, 1935). This time, Withers was the star of the show, a United States Marine battling a masked mystery villain called the Tiger Shark. The Shark was determined to keep the Marines from using his island headquarters as a military base, but Withers and co-hero Adrian Morris put a stop to his sabotage attempts. Fighting Marines, Mascot’s last serial before merging with other studios to form Republic Pictures, was also one of their best, replete with colorful locations and exciting action sequences. Withers delivered a cheerfully energetic performance throughout while simultaneously maintaining a properly Marine-like toughness, trading wisecracks and pranks with Adrian Morris but also dashing into action with square-jawed determination. Above: Grant Withers and leading lady Anne Rutherford in a publicity still for The Fighting Marines (Mascot, 1935). Above: Grant Withers and Adrian Morris in The Fighting Marines. Withers returned to Universal Pictures in 1936 to play the title role in Jungle Jim, a safari adventure based on Alex Raymond’s comic strip. The cliffhanger’s plot concerned a search for an heiress who had been shipwrecked as a child and was now living in the remote jungle as the “Lion Goddess” of an isolated tribe. Withers, as expert guide Jim Bradley, was asked to lead an expedition in search of the girl, but declined due to a prior commitment. His pal Red Halloran (Frank McGlynn Jr.) then took on the job, only to be murdered by the henchmen of the girl’s uncle, who wanted to make sure she didn’t return to civilization to interfere with his possession of the family fortune. To avenge Red’s death, Jim took charge of the safari, ultimately locating the Lion Goddess and returning her to civilization, despite interference from the uncle’s gang, a pair of fugitive criminals, hostile natives, and various wild animals. Jungle Jim was perhaps the best of Withers’ starring serials, thanks to its exotic sets, involving plot, varied action, and strong supporting cast (including Henry Brandon, Raymond Hatton, and Bryant Washburn). Withers’ dogged toughness fit his part perfectly, particularly in the scene where he found the dying Red Halloran and grimly but calmly resolved to track his murderers. He also was believably patient and gentle in his scenes with Betty Jane Rhodes’ “Lion Goddess,” as he tried to reacquaint the girl with her true background. Above: Jungle Jim Bradley (Grant Withers, right) and his pal Malay Mike have escape a volcanic explosion at the cost of a ducking in this scene from Jungle Jim (Universal, 1936). Above: Withers tries to avoid becoming cat food in Jungle Jim. Shortly after finishing Jungle Jim, Withers appeared in Radio Patrol (1937), his final Universal serial and his final starring cliffhanger. Based on a comic strip by Charles Schmidt and Eddie Sullivan, Patrol starred Withers as a police officer named Pat O’Hara, who tried to solve the murder of an inventor and became involved in a complicated mystery involving a fugitive convict, a formula for flexible steel, a sinister Middle Eastern ambassador, a crooked industrialist, and a mysterious killer. O’Hara ultimately cracked the case and won a promotion to the detective squad, with the help of his partner (Adrian Morris), the inventor’s son (Mickey Rentschler) and the fugitive’s sister (Catherine Hughes). Radio Patrol was a very well-made crime serial, with a complicated but non-confusing plot and vivid Depression-era urban locations (including a a steel mill and a junkyard). Withers was perfectly cast as a determined, level-headed “cop,” a realistic hero the audience could identify with as he sorted out the plot’s often fantastic tangles. 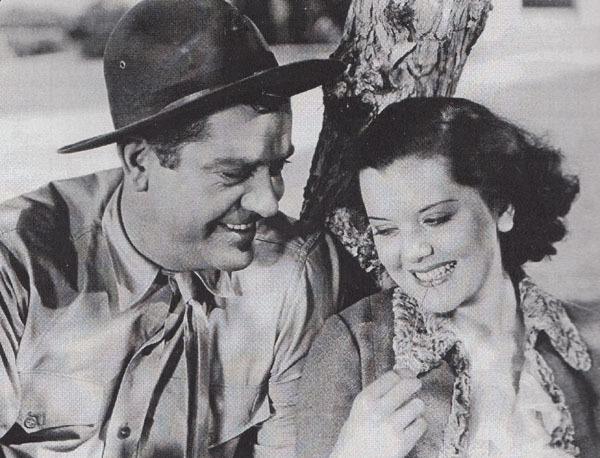 Above: Mickey Rentschler and the uniformed Grant Withers aid Catherine Hughes after a car crash in Radio Patrol (Universal, 1937). Above: Withers, in plain clothes this time, has the drop on a trio of thugs in Radio Patrol. Adrian Morris, in light suit, aids Withers. The heroes’ canine helper Silver Wolf can be glimpsed between Withers and Morris, while the thug closest to Withers is Tom London. Withers made his last serial, the energetic Columbia Pictures thriller The Secret of Treasure Island, in 1938. This time he was a heavy, a role he would play for most of his subsequent screen career. Withers’s character was Gridley, the vicious, ruthless henchman of a villain called the Shark (Walter Miller). The Shark was seeking a pirate treasure on a Caribbean island, and Gridley was ostensibly aiding him, while doing his best to get the treasure for himself. Withers gave this villain the same determination he had imparted to his heroes, making the character a frighteningly tireless bad guy. Gridley obviously felt that force was the only way of getting what he wanted, and he exerted force early and often, continually threatening hero Don Terry and heroine Gwen Gaze with brutal violence and doing his best to make good on such threats. Gridley’s single-minded villainy was his undoing, though; in the final chapter, he became too preoccupied with his attempts to explode Terry and Gaze to make his escape from a volcanic eruption. Above: The mustached Grant Withers attacks Don Terry in the back of a speeding ambulance in The Secret of Treasure Island (Columbia, 1938). Withers starred in a few more B-films in the late 1930s before settling down to a long career as a character actor in major and minor films, a career that lasted throughout the 1940s and into the 1950s. He specialized in playing nasty heavies, but managed an occasional sympathetic role as a gruff policeman or genial “working stiff.” In 1944, he signed a ten-year contract with Republic Pictures, and worked extensively in their B and A-westerns, usually playing villains opposite stars like Roy Rogers, Bill Elliott, and John Wayne. He also became a regular member of director John Ford’s stock company during this time, appearing in Ford westerns like My Darling Clementine (as outlaw Ike Clanton), Fort Apache (as a corrupt Indian Agent) and Rio Grande (as a grumpy but persistent marshal pursuing fugitive Ben Johnson). After his Republic contract expired in 1954, he worked chiefly in television, appearing in some meaty supporting roles on shows like Cheyenne (as an embittered ex-lawman turned to crime) and Wagon Train (as a revenge-seeking cattle baron who relented in the end). His final role was a sympathetic part (the leading lady’s father) in a 1959 episode of the Rory Calhoun series, The Texan. Sadly, Withers, suffering from illness and personal problems, killed himself with a barbiturate overdose in 1959. Grant Withers will always be remembered by movie buffs as one of the best villains in the business, but serial buffs will also recall that Withers lent his tough-guy presence to some memorable heroic roles. Few actors could convey quietly tough heroism and bulldog-like tenacity as well as Grant Withers could, and few were as perfectly suited to starring chapterplay roles as Marine non-coms, policemen, and other down-to-earth but authoritative types. Above: Grant Withers in a somewhat intimidating publicity still for Radio Patrol (Universal, 1937). Acknowledgements: A 1929 Photoplay magazine article on Grant Withers, written by Janet French, provided me with biographical information on Withers’ early years.